Our driver Ryan Hansford was thrilled to drive the Torana, our small team was enjoying the challenge and the Multispares customers and guests were loving the old classic race cars, the V8 race engines and close racing. Two Australian motorsport iconic surnames of Bowe and Johnson were the drivers to beat and team owner Rod Dawson decided that the team required a brand new A9X Torana to take on the Johnson Mustang and the A9X Torana of John Bowe. It didn’t take long for Rod to realise these cars were a massive build, as they are literally a V8 Supercar inside a 1970’s body. Just the bodyshell alone ended up being approx. 300 hours work. 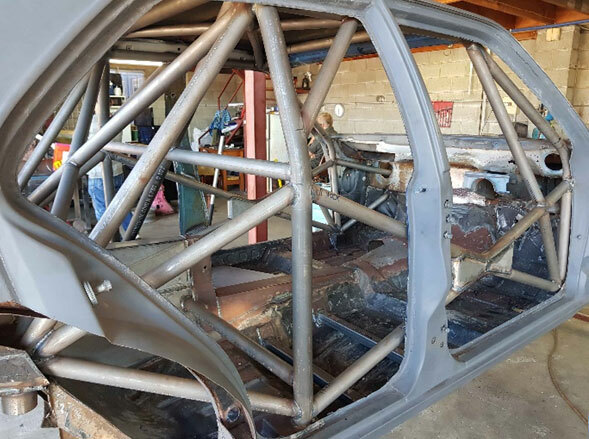 The design of the roll cage and suspension was done by ex-McLaren F1 designer Barry Lock, who armed with the TCM rule book was entrusted to come up with a race car that was on the edge but would take on and beat the 5+ year’s development of the two leading cars. 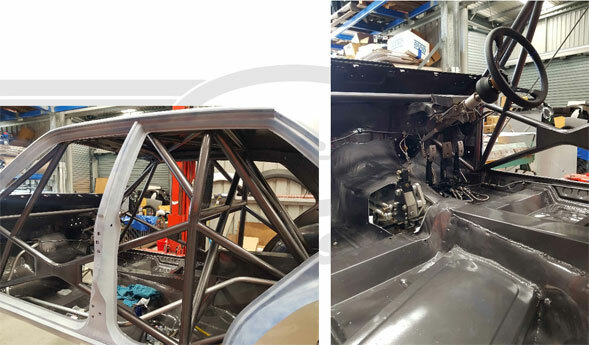 As the 2018 season was in full swing the team also rebuilt another TCM Torana which would become the team drive day car and it was ready for the 2 days in November at Mt Panorama Bathurst where 20 Multispares customers drove the replica race car with the driver Ryan Hansford sitting in the passenger seat. What a fantastic experience and life time memories. The two days this year will be December 2nd and 3rd. 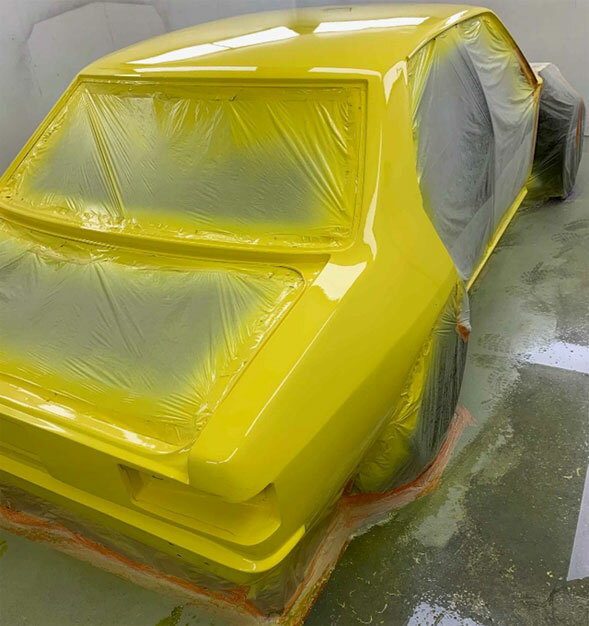 Fast forward to 2019 and after the Christmas/new year break, the team worked 7 days a week and night shifts to get the new A9X Torana finished. One of the advantages of going to the A9X was the wider front and rear track but this together with the rules provided an extra twist fitting the front wheels and tyres under the guards and flares. The new A9x also received new Brembo brakes, Motec engine management and a new 600+ HP engine. Whilst fuel tanks, seats, seat belts and steering wheels could be purchased all the other parts had to fabricated and made from the designer’s plans. 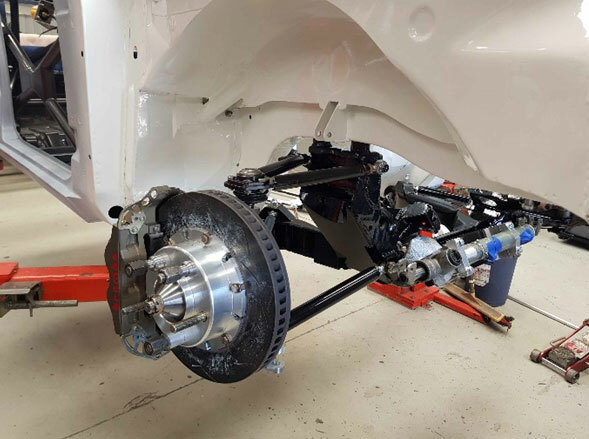 With all the parts made and the Torana back from the paint shop, it was then onto the final assembly and with 1 week before the Multispares Torana was loaded into the transporter, it was rolled out at Queensland Raceway for its first and only hit out. The test day was the only day available with so many Supercar teams based in SE Qld booking the track but it went brilliantly with Ryan finding it nice to drive and super-fast around the “paperclip” layout Queensland Raceway. On to Adelaide 500 and the first round of the Touring Car Masters series and in practice Ryan immediately found the new car real tricky to drive over the kerbs around the street circuit. Remaining dates for the 2019 Touring Car Masters series.